Hello everyone, I'm here with another exciting tutorial. This time we are going to learn how to make clouds. This is very interesting, but still a very hard topic. There are many ways to create clouds. Many Software packages provide their own cloud generating modules, such as Vue, Maya, Houdini, etc... but we need plugins if we are using 3ds Max. There are two or three plugins for 3ds Max that you can use to make clouds. For example, Fumefx, Afterburn or DreamScape. As you all know, there are two types of plugins, fluid based and texture based. FumeFX is a fluid based plugin and Afterburn is texture based plugin. In this tutorial we are going to learn how we can create clouds with the help of FumeFX, which again is a fluid based plugin. So get ready for this exciting tutorial…!!! To Create a Geosphere, go to the Create Panel > Geometry > Standard Primitives > Geosphere. Click on the Geosphere button and generate it in the viewport by clicking and dragging. Now it’s time to modify the Geosphere's parameters. Select Geosphere 01 and go to the Modify Panel. Set the Radius to 150.0 and the Segments to 20. Now let’s add a Noise modifier. To add a Noise modifier, select the Geosphere and click on the Modifiers drop-down menu and choose the Noise modifier. Now make the following changes to it's parameters. * We are going to animate the Phase value from frame 5 to frame 25. As soon as you turn on the Animate Noise option, you will see keys appear at frame 0 and 100. Now what you have to do is just select the first key, which is on frame 0 and move it forward on the timeline to frame 5. Now select the second key, which is on frame 100 and move it to frame 25. Now you can see the noise animation is only happening between frame 5 and 25. I know what you are thinking. “What is this copy & arrange...?” Right..?? I'll tell you. What we are going to do is make multiple copies of our Geosphere and arrange them as per our requirements or our shot's requirements. For example, I created a big box to arrange my scene. I placed each and every Geosphere inside the box with random positions and rotations. Not a single Geosphere crossed the boundary of this box. So what's the advantage of doing this? This technique will help you determine your scene size, whether it's big or small, and you can create your Fumefx container to match the size of the box. We are going to use a FumeFX Object Source to create our Clouds. To Create the FFX Object Source, follow these steps : Go to the Create Panel > Helpers, click on the Dropdown menu and select FumeFX from the list. Click on the Object Src Button and generate it in viewport by Left Clicking and dragging (you can place it anywhere in the scene.) Rename the FFX Object Src01 to "FFX Cloud Src". Go to the Create Panel > Geometry and click on the Dropdown menu and select FumeFX from the list. Click on the FumeFX button and generate the FumeFX Container in the viewport by Left Clicking and dragging. Now rename it from FumeFX01 to "Cloud-Container". Place this container in the same position as the "big box" we already created. Open FumeFX, go to the Gen tab and set the following parameters for each section. Output Path: Click on the small button next to Output path, make a New Folder on your Storage Drive and save your cache file (fxd) as "Cloud_test_" in that Folder. Go to the Sim tab and set the following parameters for each section. *We are going to animate the Time Scale, because we don’t want any motion after a certain frame. So what we’ll do is keep the Time Scale set at 1.0 from frame 0 to 30, and on frame 35, we’ll set the Time Scale to 0.01. Note - Don’t Change any parameters for the Smoke or Temperature, keep them Default. We are not changing anything under this tab. We are not changing anything under this tab either. Note: Keep all other parameter as default. Before start working on this tab, we need to add some lights. We will use one Omni Light. Go to the Shadow Parameters rollout and turn On Atmosphere Shadows. Note - Keep everything else at default. Note - This is Final Step before you hit the Simulation button. Add the FFX Cloud Src to the Objects tab. When you select the FFX Cloud Src, another tab will appear called Simple Source Parameters. Now add all the Geospheres to the Objects list. Velocity: We change the velocity parameter, because it’ll affect the motion of the smoke as per the Geosphere animation. Hit the Simulation Button. It may take around 6 or 7 Hours for this 100 Frame Simulation. I want to share one important thing with you. If you want to work with plugins like FumeFX or RealFlow, you'll need a very high-end Machine because if you are working on big scenes and you don’t have such a machine. The software will crash every time and you won't be able to deliver the project on time, or deliver it at all. I’m using a Intel Core i7 - 2700K CPU @ 3.50GHz with 16GB Ram, and it still takes 3 to 4 minutes to simulate a single frame of this cloud. After the simulation completes, let’s create a background image. Create a Plane and place it in the background. We'll apply a cloud texture to this plane. After the simulation is complete and the scene is setup. Go to the Render Setup by pressing F10, or by going to Rendering > Render Setup.... Render the animation as a image sequence using a HD resolution of 1280x720. Open After Effects and load the image sequence you rendered from 3D Studio Max. Add your real Cloud image in as the background. And then add your cloud layer (your rendered image sequence) over top. You can also try adding an Adjustment Layer on top and applying these effects to take it further. There are two ways to create such clouds. in 3D Studio max. The first is what I've covered here, and the second is creating small geometry setups and using multiple FumeFX containers and placing them as per your requirements. 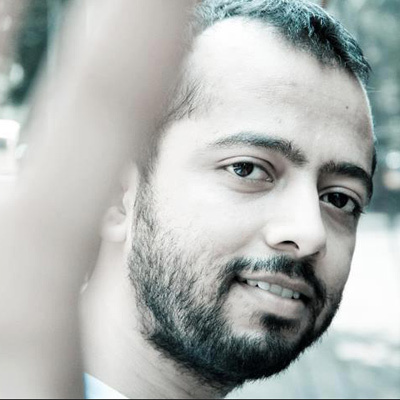 This is Vikrant, I have eight years of experience in the VFX industry & Graphic Design. Recently I started my own Design Studio “Project01 Design Studio”. After spending eight years in production, now I'm ready to share my knowledge with people who love VFX.